Hey there, and thanks for stopping by. Today, we’re taking a look at the best Barnett scopes. Barnett is best known for their budget-friendly crossbows, but like most x-bow manufacturers, they also distribute scopes under their name. This article will point out our top picks from Barnett’s lineup of crossbow scopes, along with what you can expect from their products. What’s The Best Barnett Scope On A Budget? Barnett’s most budget-friendly offering is the 4x32mm multi-reticle crossbow scope. This particular model offers a five aiming points on its reticle, provides excellent image clarity at long range, and provides you with a very wide field of view. The downfall of this accessory is that it isn’t nitrogen-purged, so it fogs up at colder temperatures, and the included rings are very poorly made. What Is Barnett’s “Best Of The Best” Scope? 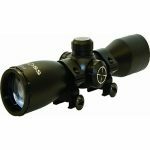 Perhaps the best glass the company makes is its 1.5–5x32mm illuminated crossbow scope. This particular variant provides red or green illuminated reticles, which are set up with ten yard markers to provide aiming points from 20 to 70 yards. It comes with scope rings, which are pretty good quality, as well as lens and eyepiece caps. An outstanding feature of this scope is its accuracy, once you dial in the speed selector to your crossbow’s velocity (300 to 425 FPS). The only real drawback I’ve noticed is that it, like the 4x32mm scope, isn’t nitrogen-purged, so fogging can be a problem. What About Red Dot Sights? Does Barnett Make These? Absolutely! 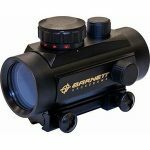 The Barnett Premium Red Dot Crossbow Sight features red or green illumination with 11 brightness intensity settings. Unfortunately, it’s not a very good sight. It’s constructed of pretty cheap plastic, doesn’t have an auto-off function, and has been widely reported to fail completely during the sight-in process. Does Barnett Manufacture Its Own Scopes? There’s no definitive word on this issue, but I suspect these scopes are manufactured by a third party and then sold with Barnett’s name and logo. My reasoning for this assumption is this: Barnett prides itself on producing its crossbows in the United States, with even the majority of the components locally produced. By contrast, the company’s scopes are made in China. What Do Barnett’s Scopes Have In Common? The most obvious common characteristic of Barnett’s scopes is the affordability of the products. This company keeps prices down, allowing you to add a new scope to your x-bow without breaking the bank. Most, but not all, of these pieces of glass fail to offer a speed dial to set the scope up for the velocity of your particular crossbow. The only exception to this is the variable zoom model. What Kind Of Optics Can I Expect In These Optics? Barnett tries to keep its prices down on these scopes by skimping where it really matters: the optics. Rather than fully multicoating the glass surfaces, Barnett just multicoats them. The company builds the scopes to be waterproof and pretty shock-proof, but neglects to nitrogen-purge the optics chambers. The end result of this is a scope that is great in warmer climates, but fogs up pretty easily in cold weather. How Good Are The Reticles On Their Scopes? These are actually pretty good, offering aiming points for the most common ranges crossbow archers will be shooting from. For the models that don’t offer a speed selector, the owner’s manuals do an excellent job of explaining how to determine what range each of the reticle markers should be for your particular configuration. How Bulky Are The Scopes, Typically? Barnett’s scopes aren’t bulky at all, and are in fact among the lightest optics on the market. Sure, you can find lighter glass, but just barely. Barnett uses lightweight materials in building its scopes, and keeps the overall size within reason as well. Will I Get Much Magnification From Barnett’s Glass? When you’re hunting with a crossbow, you don’t really need much magnification. Most x-bow hunters make do just fine with a 3X or 4X optic, and Barnett knows this. The company doesn’t try to blow things out of proportion by manufacturing an 8X scope, sticking instead with the most common zoom levels. Its non-illuminated offering provides 4X magnification, and the illuminated scopes are sold in either a 3X model or a variable zoom variant that ranges from 1.5X to 5X. Do Barnett’s Scopes Offer Good Light Gathering? Since these scopes are predominantly just multicoated, transmittance isn’t as good as it could be. With that said, I’ve used all of Barnett’s scopes in low-light conditions, with mostly excellent results. 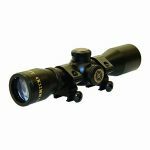 The brightness settings on the illuminated crossbow scopes are perfectly suited to almost any lighting condition, and the sight pictures are bright with plenty of contrast and good color reproduction. 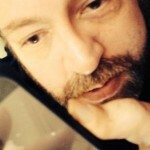 What About The Field Of View? Barnett shines in this category, offering fields of view that are typically wider than average. You don’t have to worry about losing track of small, fast-moving prey like rabbits or squirrels with these scopes, and larger game like deer or elk are equally easy to track and lead. How Easy Are Barnett’s Scopes To Mount And Sight In? This is a bit dicey, depending on which model of scope you purchase. The included rings are often garbage and need to be replaced with a better set. Even worse, though, is the failure rate – a number of Barnett’s scopes and red dot sights have been known to fail during the sight-in process. In some cases, the reticle turns sideways as you are trying to sight in the glass. In other cases, the windage and elevation knobs just stop doing anything at all. Can Barnett’s Optics Take A Beating? For the most part, yes. Barnett’s scopes are built to be rain-proof and shock-proof, but they can’t stand up to the effects of thermal shock that go hand-in-hand with hunting in most parts of the country. Without the benefit of nitrogen-purged optics chambers, these scopes just fog right up when exposed to colder winter temperatures. Thanks for coming over to see what I think of Barnett’s scopes. If you’re on a budget, these accessories are almost always a good buy, with a few caveats. You won’t be able to use them very well in colder temperatures, and you have to worry about the failure rate of the scope. There’s no feeling worse than getting out to the archery range two days before hunting season opens to sight in your x-bow, only to find out that it’s failed on you.